I'm modeling counts of organisms over time at eleven locations. 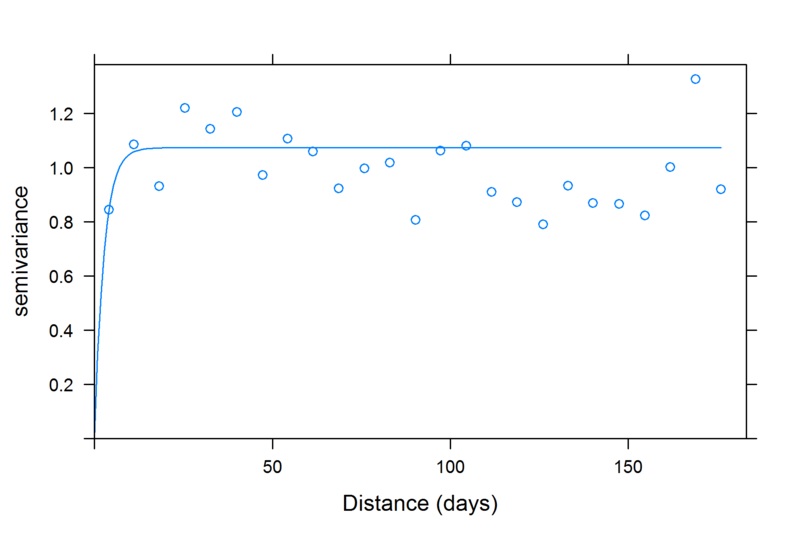 I'd like to account for temporal autocorrelation in the counts, assuming it's present. As the data are not equally spaced in time, I'm exploring empirical variograms (and comparing variogram model fits) based on the residuals of a generalized linear model assuming independence. As shown below, the variogram based on the classical semivariance estimator looks quite different from the robust (Cressie) estimator. Furthermore, a fit of most variogram models to the classical variogram produces singularity errors (with good reason based on the variogram plot) while a decent exponential model (e.g.) can be fitted to the robust variogram. Unfortunately, it seems as though nlme:::lme (which I'm using for the generalized model) only uses the classical variogram when fitting correlation structures. (1) Is the use of the robust estimator for constructing the correlation structure justified in this case? (2) If so, is it appropriate to fit the the robust variogram model in, e.g., gstat or geoR, and then specify/fix the correlation structure in the lme fit? Interesting finding, and thanks for the perfectly prepared reproducible example! Both variograms you mention are meant to prepare for linear kriging in the next step, and you may not want that. The robust variogram was (IIRC) deviced for normal data with some pollution (outliers), but not for count data. I would advice to look at model-based geostatistics, and since you mentioned count data, you'd probably end up using package geoRglm. The canonical reference is the book with the same title by Ribeiro and Diggle. You should also look at package geoCount which was just published in issue 11 found here; the paper includes comparisons with geoRglm and INLA (yet another alternative). Not the answer you're looking for? Browse other questions tagged r geostatistical-analyst autocorrelation or ask your own question. Interpreting variogram: negative values beyond model sill? 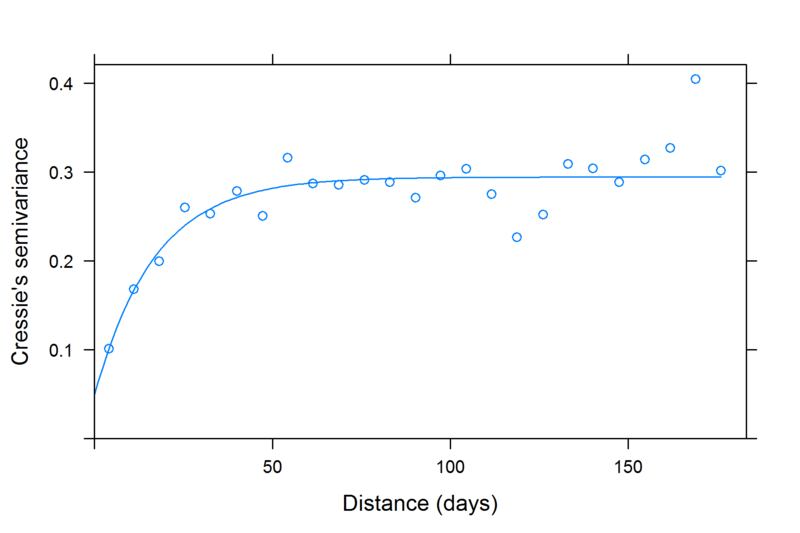 Using Moran's I test for spatial autocorrelation on residuals from logistic mixed model?